Show Us a Daily Dose of Love during Best of the Best | Podiatry Associates, P.C. There are a lot of things you should do every day: wash your face, brush your teeth, get dressed, eat meals, and vote. Yes, vote! 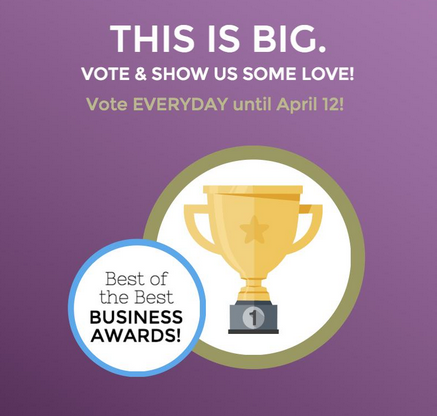 It’s time again to elect the Best of the Best businesses, so now’s the perfect opportunity to add one more activity to your daily routine—voting for Podiatry Associates, P.C. and Castle Pines Physical Therapy. The links will take you to a voting page where you can register and provide a password, then select Podiatry Associates from the “podiatrist” category, and Castle Pines Physical Therapy from the “physical therapy” section. Be sure to vote for each at each location. Then tomorrow, we’d appreciate if you did it again! We are committed to providing you with the best possible foot care and rehabilitation services. Whether you need help with a painful foot or ankle condition, or want assistance to accelerate your recovery, our podiatrists and physical therapists are here to help. Now’s your chance to help them back! Show us some love—vote today and every day if you think we’re meeting our goal of the best care possible! If you have any questions, feel free to call us at (303) 805-5156. We are happy to explain the contest, and of course, help you with any of your foot care needs. Thanks so much for your support! We’ve got the best of the best patients around!